You may not be ready to think about the winter holiday season yet, but it’s just around the corner – and tax season will be hard on its heels. Preparing now can ensure you are able to adapt to whatever comes your way. No matter what time of year is your company’s busiest, it’s critical to have a plan in place to find and hire the best talent. Don’t assume high unemployment means a better worker pool. In fact, the unemployment rate has very little effect on a business’s ability to find qualified seasonal workers. The key term here is qualified. You’re looking for people who are adaptable, quick to learn and have the technical skills needed to succeed on the job. When planning for your seasonal hires, ignore the unemployment rate – it won’t help you find the people you need. Prepare a detailed job description. Whether you hire long term or only for a few weeks, a job description draws in the kinds of candidates it describes. To get the qualified seasonal help you need, make sure the job posting is clear and straightforward about both the technical skills and “soft skills” it takes to succeed on the job. Mine your referrals for good candidates. Your core staff, top seasonal workers from past years, and other business colleagues can become your best resource when it comes to finding the best seasonal staff. Ask around. And don’t hesitate to approach loyal customers – they know your business, and they may be personally interested in working for you. Maintain a formal interview structure. Many business owners become tempted to skip interviewing for seasonal candidates – at their peril. Use a list of behavioral interview questions to help you gauge how each employee will handle the temporary work. Your recruiter can help you prepare to interview seasonal workers. Train them. 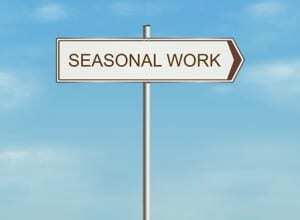 Investing time in onboarding seasonal workers pays off in lower turnover and better productivity. Tailor the training to the job and to your business’s structure. A simple training manual or a day or two of onboarding may be all your seasonal staff need to do their work well. Be willing to move on. If a seasonal employee isn’t working out, don’t “hang on” for the remainder of the season. Be willing to let them go; then talk to your staffing partner about why that person didn’t work out. The sooner your staffing firm knows about the problem, the more quickly they can find someone who will shine in the job. Bringing on staff to alleviate talent shortages during your busy season can be a smart business move. If your company is facing a busy season and are looking to bring new employees on, start this process early. Once you have identified your needs, coordinate with your recruiter so they can help you find and hire the best talent available. At TERRA Staffing Group, our recruiters can help you find the best seasonal staff for your needs – year after year. Contact us today to learn more about our seasonal staffing services in Phoenix, Portland and Seattle.